And so there is no point in giving publicity to this juvenile work. But friends and relatives, who know of my toil, are particular that it should see the light of day for what it is worth. The acceptance of my book by T.T. Devasthanams for financial aid signifies to me that the Lord of the Seven Hills has sanctified with His touch my labour of love. And so I venture to place it before the reader for his consideration. Sage Vyasa has classified the Vedas; he has expounded eighteen Puranas; he has produced a monumental work, Maha Bharatam, which is universally acclaimed as the Fifth Veda (Panchama Veda). It is strange that even such a savant as he becomes enveloped in a gloom of cheerlessness and despondency. The divine minstrel, Naarada, appears before him, pinpoints the cause for his sadness and counsels him to get relief by working on Bhagavatam. Naarada is an offspring of the mind (manasaputra) of Brahma, the Creator of the Universe; he is a perfect sage (jnaani); he knows the nature of the Supreme and His countless auspicious attributes; he is an ardent saint (bhakta); he clings to Him with intense love and devotion. He is a powerful propagandist of virtue and righteousness; he expels ignorance (ajnaana) and instills knowledge (jnana); he manipulates conflict between the forces of good and evil, between the divine and the demoniac propensities, and ensures victory of virtue over wickedness. 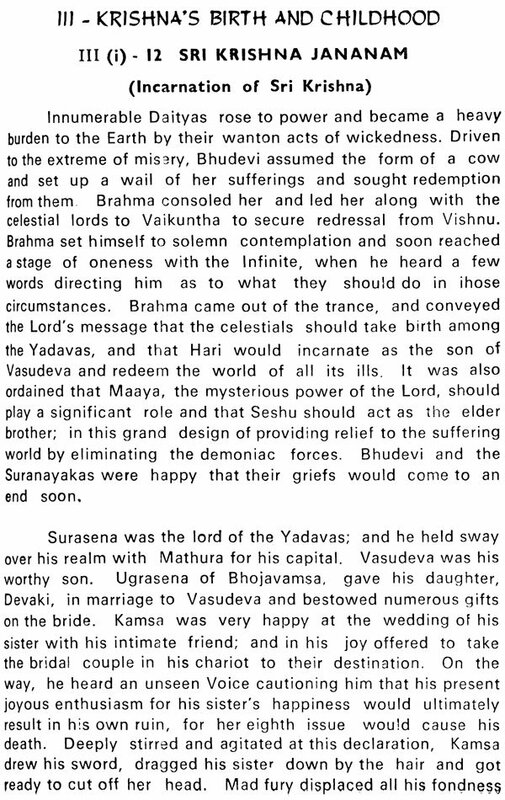 Brahma himself has directly enlightened Naarada on Bhagavatam which Lord Vishnu has, earlier, inculcated in him in a condensed form of four stanzas. 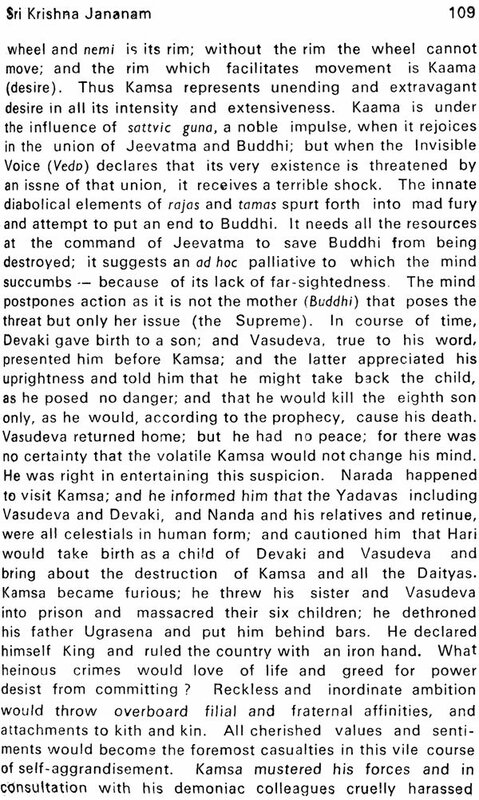 Thus Naarada is admirably qualified to impart the sacred composition to the disconsolate Vyasa, so as to enable him to find speedy relief. 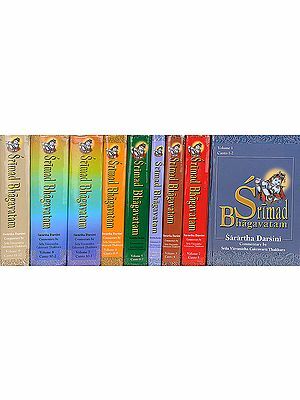 Vyaasa with his talent for intensive introspection and extensive elucidation produces a monumental masterpiece, Srimad Bhagavatam. 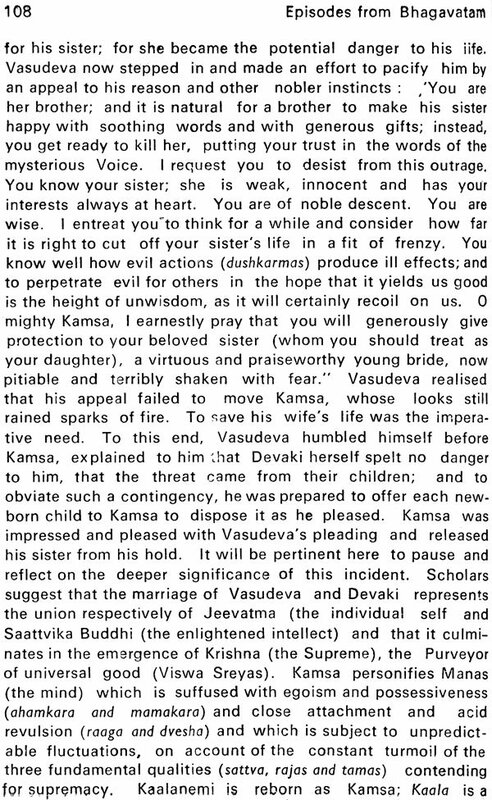 Vyaasa imparts enlightenment to his son, Suka, with this devotional epic. Suka is a born ascetic; he renounces everything, even a loin-cloth (and moves about naked); and he sunders all attachments and loses himself in the contemplation of the Supreme without a moment’s respite. 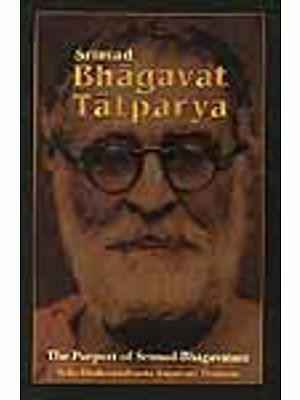 Even such as he, is unable to free himself from the hold of Srimad Bhagavatam, for the simple reason that its appeal is inescapable for one like him, who lives, moves and has his being in the Lord Himself. Suka presents himself. 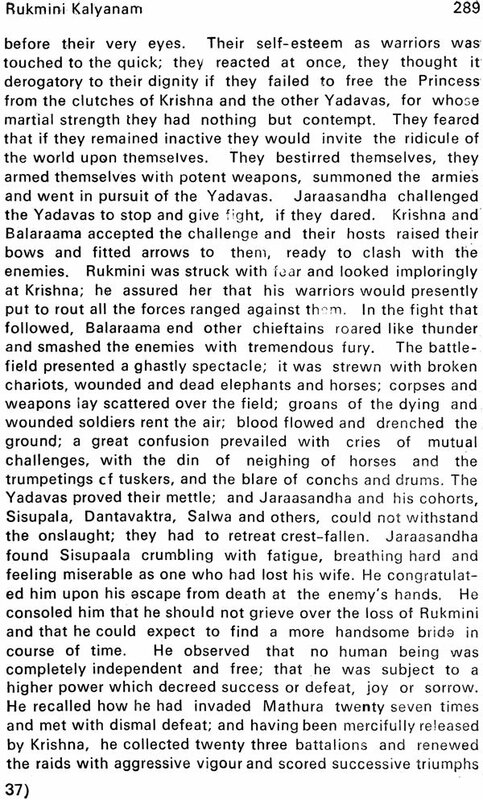 Of his own accord, before the Pandava King, Parikshit. 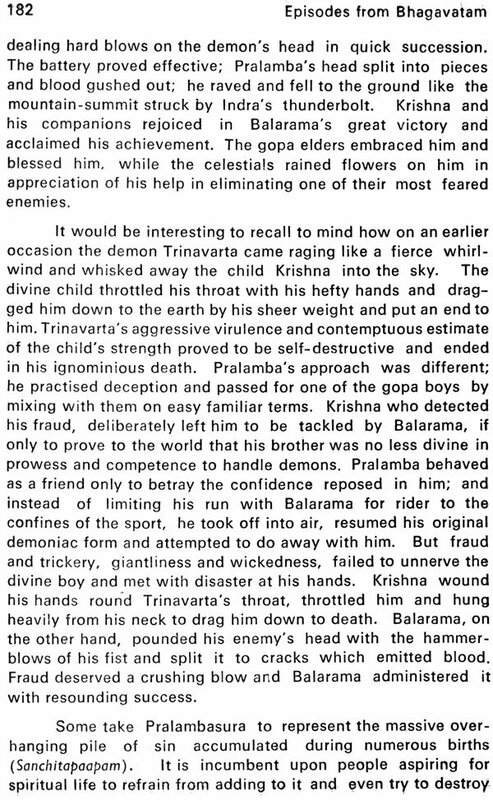 While in his mother Uttara’s womb, Parikshit had the darsan of Lord Krishna destroying Aswatthama’s potent shaft with his disc and saving his life. The moment he was born, his eyes cast searching glances all round to find his protector; and he was named Parikshit because of his keen examining looks. He has grown up to be a just king, an able ruler and a virtuous and devout person. 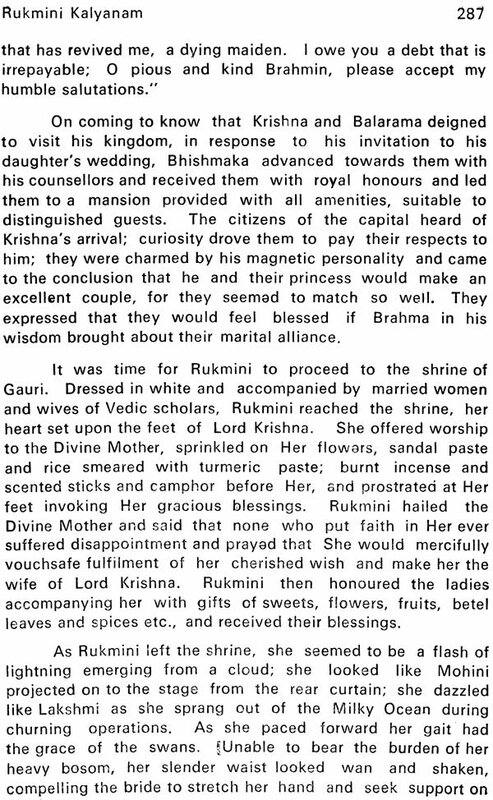 He has made up his mind to devote the brief span of just a week, before his life is to terminate under a curse, to listening to the uplifting stories of the lives of the devotees and the absorbing to the uplifting stories of the lives of the devotees and the absorbing anecdotes of the Lord’s mysterious exploits and miraculous deeds. 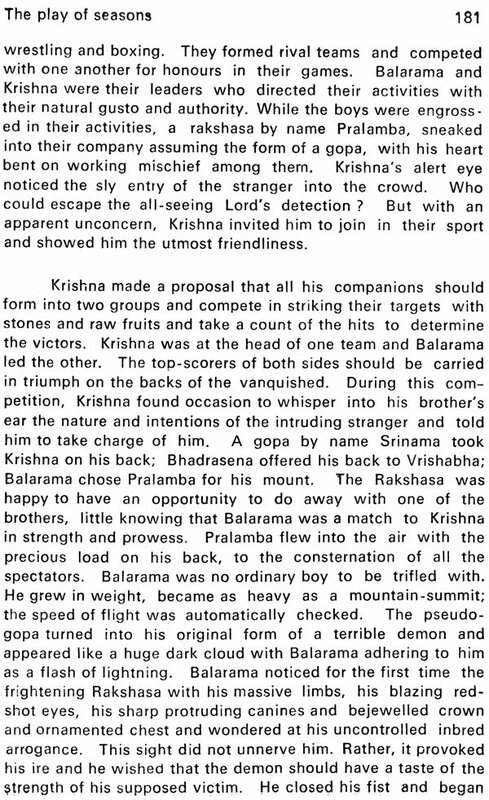 And Suka finds an eminently eligible and eager seeker of salvation to whom he can impart, with cheerfulness and enthusiasm, the illuminating gospel of Srimad Bhagavatam. The mind, as is well-known, is the arena where the fundamental qualities (sattvarajasthama gunas) are engaged in constant churning in an attempt to regain relative ascendancy. It Sattva establishes superiority, the mind receives the impress of truth, righteousness, nobility, compassion or some other similar virtue; the celestials have this tendency and so they cling to God. If rajas or tamas happens to be on the rise, the mind carries the taint of falsehood, injustice, meanness, wickedness or some such vice: the daityas develop these demoniac characteristics and range themselves against the Supreme. But peace and happiness cheer the lives of the devotees; while fear and suspicion haunt the enemies of God making their lives miserable. 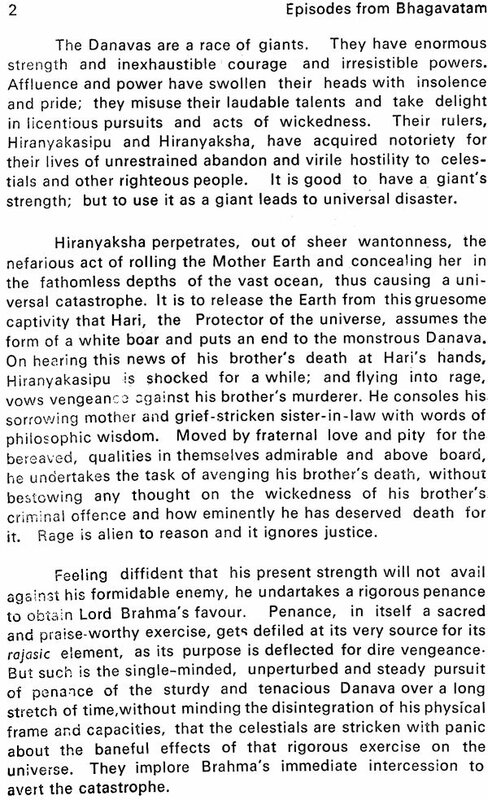 It is true that the virtuous and the vicious alike secure redemption in the end, the former by their unstinted and loyal devotion (bhakti) and the latter by their unmitigated and persistent hostility (poga). 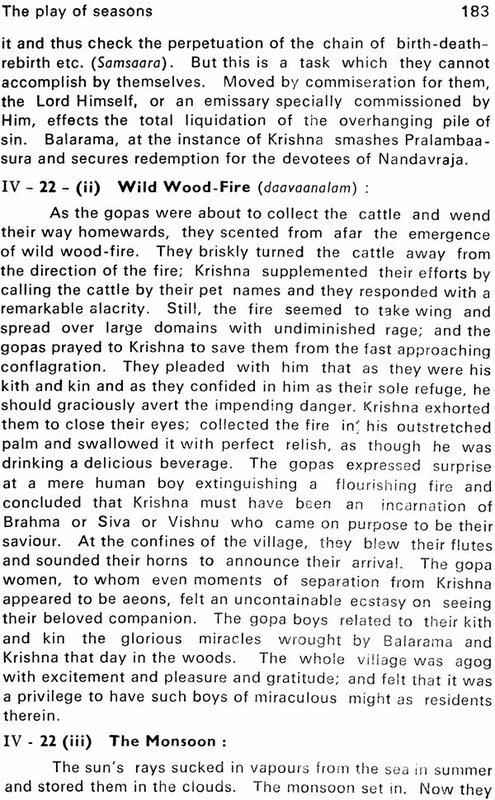 Srimad Bhagavatam impresses the readers with the magnificence and supremacy of the Lord’s majestly (ounnatya), enlightens them on the magnitude and extensiveness of His affluence (aisvarya), thrills them with the inexhaustible abundance of His considerateness (vaatsalya) and easy availability of His overflowing love (prema). 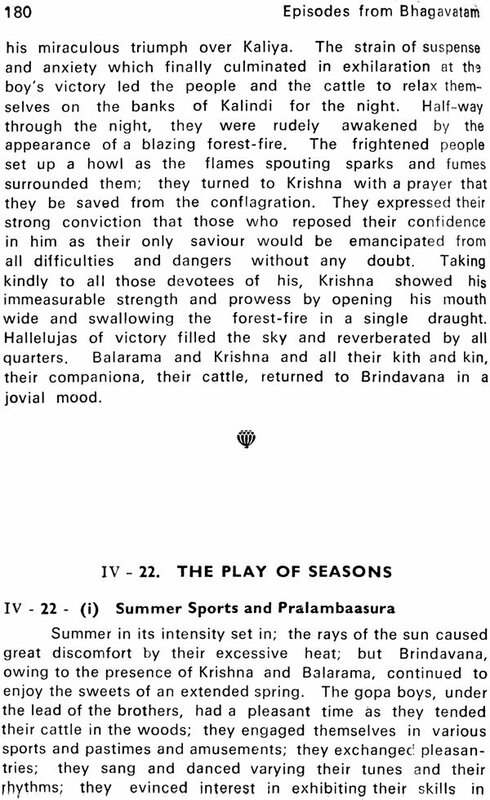 Bhagavatam inculcates in us knowledge of the nature and attributes of Bhagavan. The Agamas propound a five-fold concept of the Lord: Paratattva, Vyoohatattva, Vibhavatattva, antaryaamitattva and Archaatattva. The Supreme Phenomenon (Parabrahma) is the Great One of exceptional brilliance, the Primal Cause (Kaarana), the Over-Soul (Paramatma), the All-pervasive Spirit, Sustainer, and Ordainer of the Universe, Existence Consciouness-Bliss (satchitaananda). 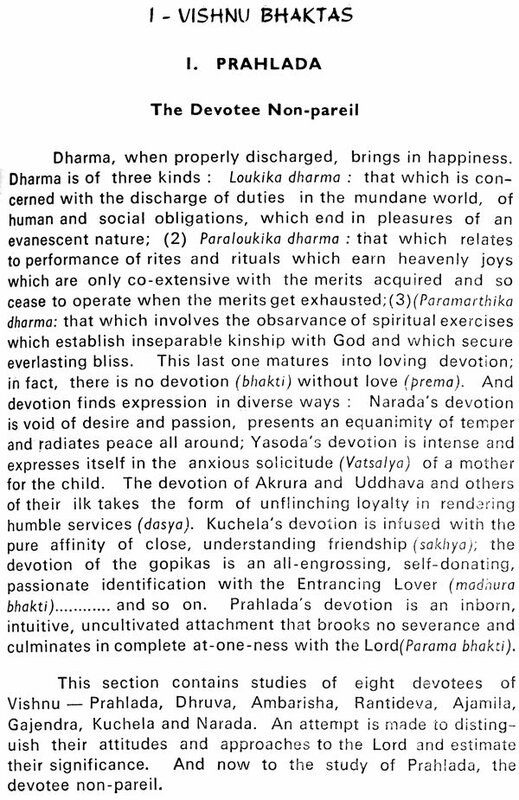 This Paratattva expresses Itself in four luminous forms (Vyuhas) for the purposes of creation (srishti), maintenance (stiti), dissolution (laya), liberation (moksha), and propagation or dissemination of Vedas (Vedapravartana). These are called, Vaasudeva, SAnkarshana, Pradyumna and Aniruddha. Vaasudevattva is the expression of six auspicious characteristics in all their completeness-Pure Knowledge (jnaana), unequalled might (bala), inexhaustible affluence (aisvarya), inextinguishable effulgence (tejas), unmitigated power (sakti) and never-failing vitality (veerya). This unexcelled form is known as Bhagavaan. Each of the three letters, Bha, ga and va, indicates two of the above six attributes; and the letter an stands for the absence of all despicable and vicious qualities: thus Bhagavan is the One who has all the six auspicious qualities and is free from all blemishes. And He is the Supreme Being (Parabrahma) whom the liberated souls worship in Vaikuntha. The other three Vyuhas emerge for specific purposes, embodying in themselves any two of the six qualities enumerated above. One of these forms lies on the Sea of Milk and when necessary manifests Itself in the world as Incarnations. But the Para and Vyuha tattvas are beyond the reach of aspirants, like nectarine waters of the Fresh Water Sea and clear waters embosomed in the clouds of the upper regions. 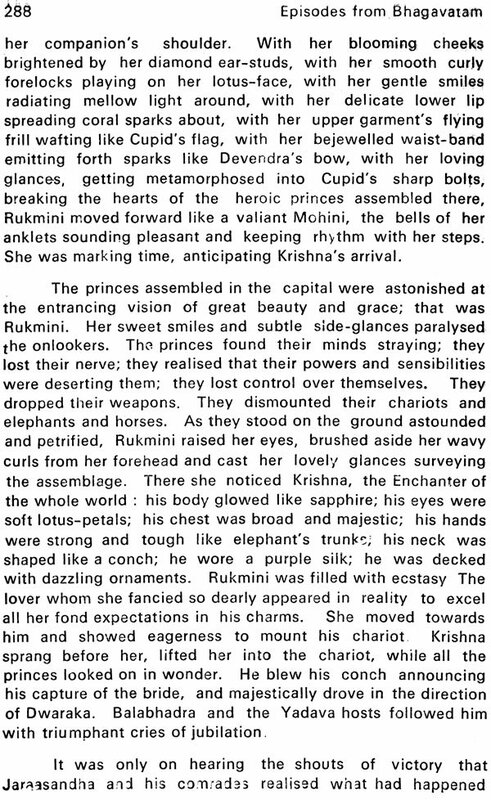 That is why the Supreme chooses to manifest Himself in incarnations and provides the devotees, who pine for Him, with opportunity to have a vision of His blessed form, and experience His gracious benevolence. Whenever righteousness (dharma) suffers distortion and heads towards collapse, the Lord takes birth to resuscitate it and to protect the virtuous and eliminate the wicked. His incarnation as Sri Rama and Sri Krishna are the most outstanding examples of the opulence of His affluence and glory (Vibhava avataaras). But such incarnations can be availed of only by those devotees who have lived in the times of their occurrence; and they have no use for people in other climes and at other times. They resemble mountain-streams which are in spate during rainy season; but which dry up in summer, when they are most needed. There is then the antaryaamitattva, by which the God-Phenomenon becomes immanent in every atom of creation and resides in the heart of every living being. The Lord is thus presently available to those who wish to have Him. He is within them; true. But few have the power of introspection to discover Him within their hearts; and even if they do, they have to draw Him up from the depths to enjoy His presence. It is like digging the bowels of the earth for drawing water. It does not bring ready relief to the parched tongue of a thirsty man. All attempts at worship of Para, Vyuha, VIbhava and Antaryami manifestations appear to bear no fruit, as they are beyond the reach of the ordinary run of mankind. 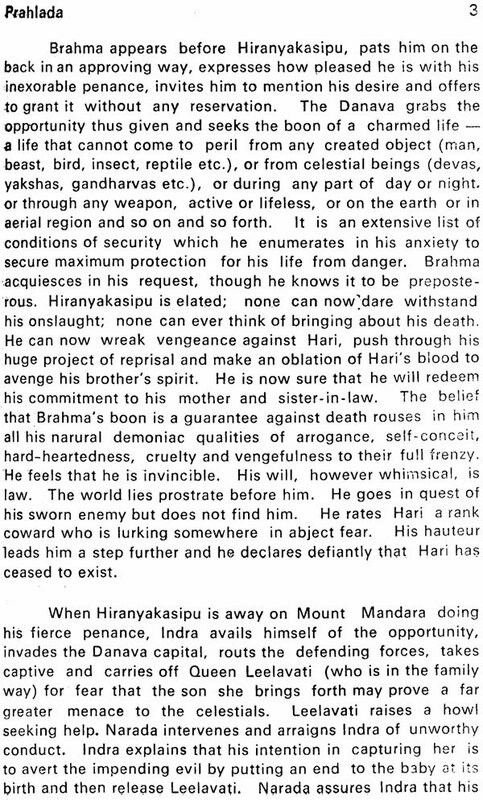 Bhagavan has therefore graciously made Himself easily accessible to the spiritual aspirants by condescending to reside in the different forms of images, or figures cut in stone or wood, reared by them each after his own heart, as objects of worship (archaamaortis). Lord Krishna has declared in the Gita: “Ye yatha maam prapadyante taam sta daiva bhajaamyaham”: “I shall appear and receive every devotee in the form and in the manner in which he worships Me.” Be it a sage (jnani) or a devotee (bhakta), be it a man sorrowing for lost possessions (aarti) or one hungering for new acquisitions (artharthi), God graciously appears before him in all His fullness in the form chosen by him and accepts the mode in which he offers his worship and fulfils his prayers. Such facility is inherent in this form of worship of an Idol (Archaamoorti). Innumerable aspirants have taken recourse to this approach sand attained the same fruits as those elect few who directly adore the Abstract Supreme.